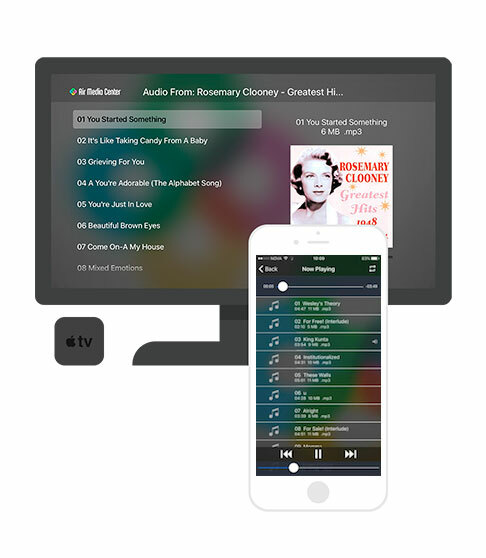 Play your favorite Movies, TV shows, Music... on your iOS device or your Apple TV from your computer. No need for any syncing. Air Media Center supports most music, videos and photo formats out there! Instantly watch your media on your device without any additional syncing or copying. This also helps you save precious storage space on your Apple TV/iOS device. Air Media Center is smarter than smart. It will automatically transcode your media to match the playback capabilities of your device. You don't have to worry about codecs or file conversions. Just tap on the video, and enjoy the show! Air Media Center creates a great UI for browsing your media files, allowing you to quickly find the file you want. No need for any tiring media setup. Air Media Center does it for you. 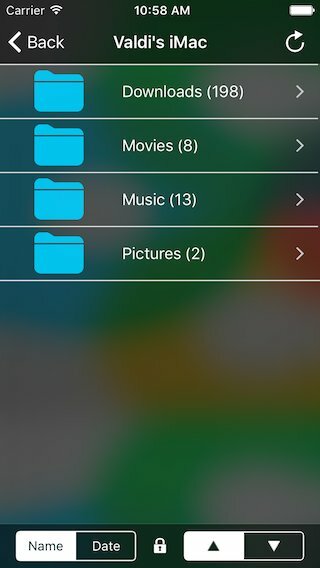 Download and install Air Media Server (free) on your computer and Air Media Center on your iOS device or Apple TV (AppStore). Launch Air Media Server on your computer and share your media. 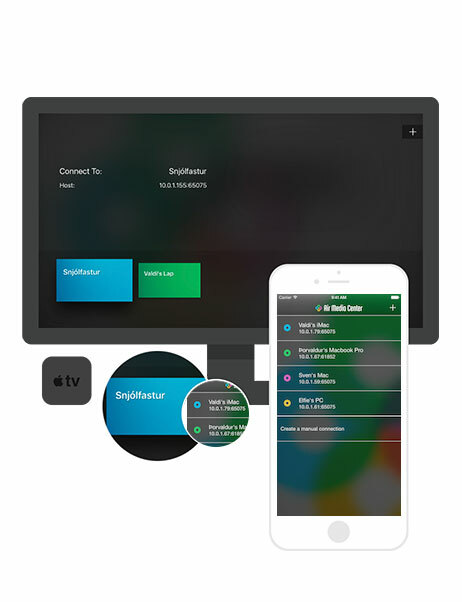 Launch Air Media Center on your iOS device or Apple TV, find your computer on the opening screen and connect. If your computer does not show up automatically press the plus sign to add a new connection and type in the host info found in Air Media Server running on your computer. Enjoy high quality media playback on your tvOS/iOS device. To provide the best possible experience, Air Media Center plays music and videos based on their order in a folder. Air Media Center has many sorting options to help you perfect the flow of videos. For example, if you have a folder containing a single season of The Big Bang Theory TV shows, naming each file something like "BigBang S01E01" and sorting alphabetically in the app lets you seamlessly play the entire season in perfect order. Air Media Center creates a slideshow from the photos in each folder. You can create a slideshow which is ready to play on your tvOS or iOS device by putting all your desired photos in a single folder on your Mac and sharing it via Air Media Server. As with video and audio files, naming the photos in alphabetical order (e.g. "Slide-1", "Slide-2", etc.) lets you to control the flow of photos. Stop paying monthly for services, it will milk you dry. How do I get my PC to show up in Air Media Center? What can Air Media Center play? So there are 2 Air Media apps? Isn't Air Media Center like Air Video? DVD from ISO appear to be stuck in DVD root menu, why? Email us at support@appdynamic.com and we will get back to you within one business day. © 2016 App Dynamic ehf., All rights reserved. Isn't AMC like Air Video? No other iOS application on the market supports as many file formats as Air Media Center! Air Media Center also adds support for music and photo streaming--- a huge advantage over Air Video. In addition, AMC also supports AirPlaying media to an Apple TV or Mac running AirServer. Support for all TV-out adapters is the cherry on top! Currently, Air Media Center runs on all iOS devices as well as Apple TVs generations 4 and above. Air Media Center is the media center application that you install on your iOS or tvOS device. Air Media Server is the media server application that you install on your computer. 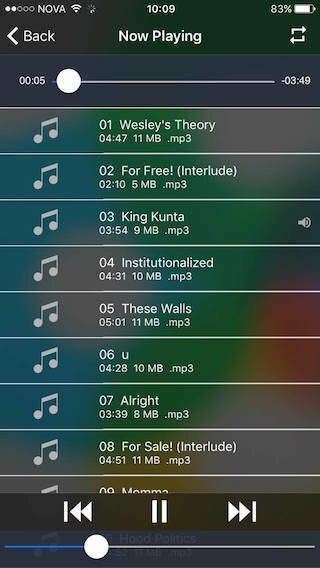 After installing and launching the applications, you interract with Air Media Center on your iOS or tvOS device to browse and select media from your computer. Air Media Server provides the file sharing and transcoding on demand. The Air Media Center and Air Media Server applications interract with each other to make the magic to happen. We have yet to come across a file format that Air Media Center is unable to play. If you find one, please let us know. Air Media Center does not support DVD chapters. All the movie files within the DVD are stiched together into one large video file. Since root menu is a video, it appears in the beginning. 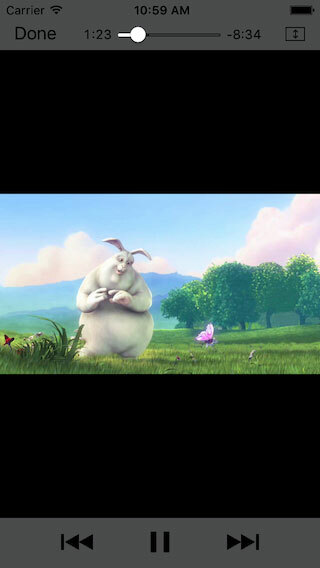 Simply scan forward to jump to the real movie. Not at the moment, but we are working on it. We will soon release an Air Media Server major update which will add subtitle support. Air Media Server uses your computers user accounts. Use your own username/password to log in from Air Media Center. On a Mac, be sure to use your account name instead of the full user name. The account name can be seen in Air Media Server's settings window, under the accounts picture. If you do not wish to use authentication, turn it off from Air Media Server settings. How to get PC to show up in AMC? To see your PC press the plus symbol in AMC and add a new connection. Choose a name for this connection and then fill in the connection info. The right values can be found in Air Media Server's Preferrences window on your PC.